Ah ha! One of my friends pointed me to this help file that has a list of functions supported by Calculated Value Fields. It’s a .CHM file located at C:\Program Files\Microsoft Office\Office12\1033\STSLIST.CHM on client machines that have Office 2007 (possibly Access 2007 in particular) installed. 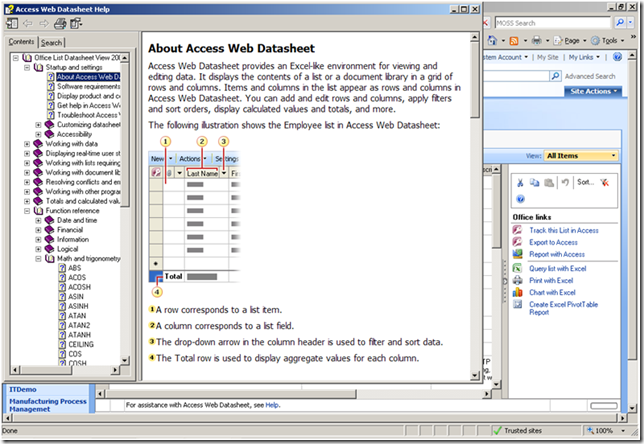 The “normal” way to get to this file is to open a list – almost any list – and change to the Datasheet view. Then expand the left hand menu and click on the Help icon. 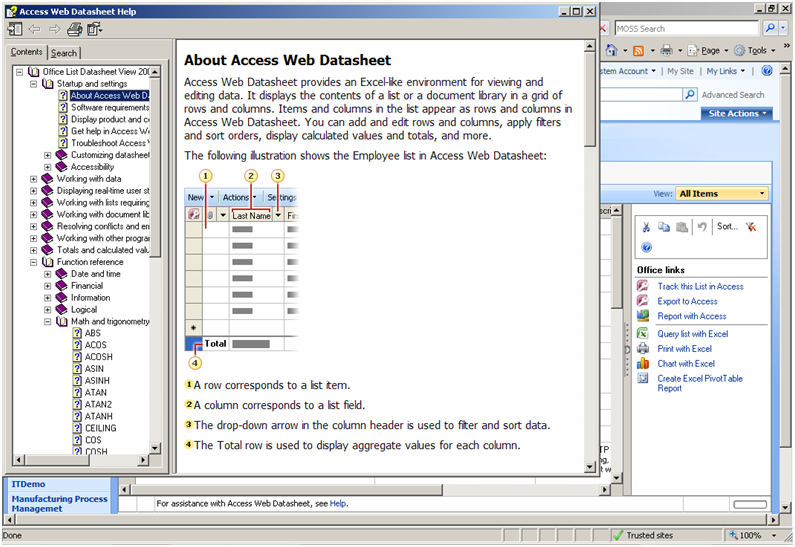 The file that pops up is STSList.CHM, its title is “Access Web Datasheet Help” and the root topic is “Office List Datasheet View 2007”. Look for the Function Reference subtopic. Thanks also to the FileMon utility from SysInternals for helping me track down the actual CHM file. PS, this is a follow up to my previous post, “What, no WEEKNUM()?”. If you have Office 2016 installed, this CHM file still exists and is located in the C:\Program Files (x86)\Microsoft Office\root\Office16\1033 folder. ← Previous Previous post: Looking forward to VS2008!